Unique shape with a scorpion in it, very vivid and delicate. 1pc x Amber Pendant(with bead rope)(RANDOM COLOR). We would try our best to help you solving any problem. We will do our best to help you to resolve your problems. $OUR BALTIC AMBER BRACELETS AND NECKLACES ARE MADE WITH 100% GENUINE BALTIC AMBER OUR SUPPLIER IS Certificated by International Amber Association This is beautigul genuine Baltic amber necklace. It can be worn alone or paired with a Baltic Amber Bracelet available in our eBay store. Our verified manufacturers do not use artificial, plastic or synthetic stones, only genuine authentic natural Baltic amber. This necklace has a plastic screw clasp and is approx. 33 - 35 cm long. Handmade the home of authentic amber, each bead is hand polished by craftsmen and individually knotted. Due to amber being a natural product the stone colour and shape may vary from bracelet to bracelet! These necklaces are all fitted with a safety screw clasp. Each bead is securely knotted in between to prevent scattering if breakage should occur. $OUR BALTIC AMBER BRACELETS AND NECKLACES ARE MADE WITH 100% GENUINE BALTIC AMBER OUR COMPANY SILVERAMBER IS Certificated by International Amber Association This is beautigul genuine Baltic amber necklace. It can be worn alone or paired with a Baltic Amber Bracelet available in our eBay store. Our verified manufacturers do not use artificial, plastic or synthetic stones, only genuine authentic natural Baltic amber. This necklace has a plastic screw clasp and is approx. 32 - 35 cm long. Handmade the home of authentic amber, each bead is hand polished by craftsmen and individually knotted. Due to amber being a natural product the stone colour and shape may vary from bracelet to bracelet! These necklaces are all fitted with a safety screw clasp. Each bead is securely knotted in between to prevent scattering if breakage should occur. Amber is about 50 millions years old, fine and always fashionable product of nature. This jewel has an enviable destiny of always being loved and appreciated by people. This stone has a positive influence both on health and destiny. $Stones: Natural Amber Beads The Necklace length: 45 cm (18.00 inch) Stones dimensions: Average size approx. 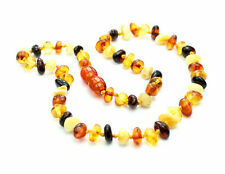 6x8 - 12x10 Stones: Natural Amber Beads The Necklace length: 45 cm (18.00 inch) Stones dimensions: Average size approx. 6x8 - 12x10. Made with PURE AMBER. Its warm, cheerful, wise, protective and healing. Baltic Honey Amber. WHY AMBER ?. The most attractive quality of AMBER is it possesses very old ENERGY. AMBER works to make sure you only work with strong and positive energy. $Stones: Natural Baltic Amber The Necklace length: 44 cm (17.25 inch) (approx.) Stones dimensions: Average size approx. 6x4 - 8x6 mm. Every Baltic amber jewelry is made of natural Baltic amber, hand-crafted by Lithuanian amber artisans with generations of experience who carefully polish and softly round the Baltic amber beads so that they lay comfortably against the skin. 100% Genuine Baltic Amber Adult Necklaces 17-18 inch - Choose your color! It is not artificial, plastic, and synthetic, reconstituted or substitute for amber. Maybe because it is easy grind and polished nevertheless it as hard as a stone. Natural Baltic Amber Heart Pendant Sterling Silver 925 - 0.95 "
Natural Baltic Amber Pendant. Sterling Silver 925. You will receive pendant as shown in picture. Stone: natural amber. Common pendant length with bail: ~ 0.95 " ( 24 mm ). Natural Baltic Amber Pendant Sterling Silver 925 - 1.45 "
Natural Baltic Amber Cross Pendant. Sterling Silver 925. You will receive pendant as shown in picture. Common pendant length with bail: ~ 1.45 " ( 37 mm ). Stone: natural amber. Material: Beeswax, bee. Size: Pendent: 5.3cm x 4cm/2.1" x 1.6". 1pc x Bee Amber Pendant Necklace. The amber is handmade, and the bee is natural. Unique shape with a bee in it, very vivid and delicate. Natural Raw Unpolished Baltic Amber. Necklace 18 " ( 46 cm ). Necklace size : ~ 18 " ( 46 cm ). You will receive necklace very similar to shown in picture. Stones: natural amber. Approximate weight : ~ 14 gram. 100% Genuine Baltic Amber Adult Necklaces 17-18 inch - Choose your color!!! It is only a small year, not buried underground (no petrochemical process). All it is closer to the raw material, not the stone. Necklace Size： 640mm （25.2in ）. Pendant Size：about42 45 16 mm（ 1.65 1.77 0.63 in）. Material: Imitation amber. The color and style of the products are not limited to those shown on the pictures. The styles have many shapes, and the plant fossils are also various. Style: Ethnic style. Natural amber Resin Light yellow. This pendant include string cord. Warm prompt. It is only a small year, not buried underground (no petrochemical process). All it is closer to the raw material, not the stone. Necklace Size： 640mm （25.2in ）. Pendant Size：about57 32 13 mm（ 2.24 1.26 0.51 in）. Lithuanian Baltic Amber is regarded as the best in the world and take great pride in sharing this healing Lithuanian Gold "Auksas" with you. ♥️10% of every sale goes to Lithuanian Mission Projects! For individuality lovers, unitary Baltic amber necklaces can impose great impression. Baltic amber necklaces can be made out of processed or unprocessed mineral. 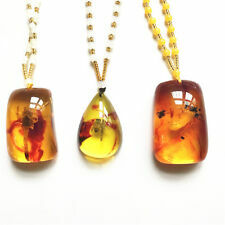 Beautiful inclusions of ancient insects or plants especially suit for such kind of amber jewelry. Baltic amber is not a gemstone or mineral, Baltic Amber is a fossilized resin, not a stone. Baltic amber instead is fossilized tree sap from prehistoric trees that grew as far back as almost fifty million years ago. Natural Baltic Amber Pendant. Sterling Silver 925. You will receive pendant as shown in picture. Stone: natural amber. Common pendant length with bail: ~ 1.5 " ( 38 mm ). Stone size : ~ 15 x 15 x 27 mm. Primary Stone: AMBER FROM COLOMBIA. Fine handcrafted jewelry personally designed from the inspiration from those little things around us. Style: Pendant. We too take and feel the delight to fabricate enticing Victorian style, traditional designs.